Halloween Hides time of year again. 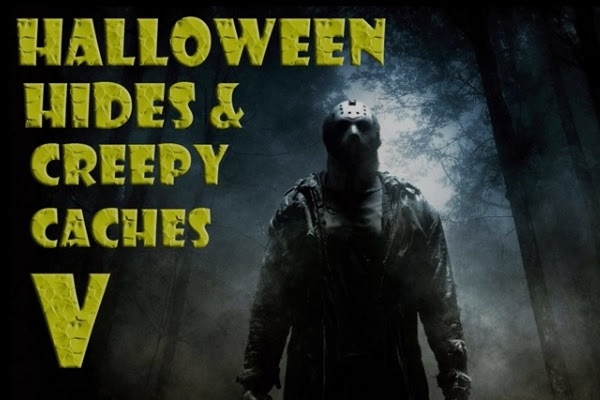 This was the fifth annual Halloween Hides and Creepy Caches mega event, and it proved to be the last one too, at least for a while. It was the second one I’d attended, having also attended the 2012 one at Stanwick Lakes. The 2014 event was held at <a href=”http://www.forestry.gov.uk/forestry/EnglandNorthamptonshireRockinghamForestWakerleyGreatWood” target=”_blank”>Wakerley Great Wood</a>, up at the very top end of Northamptonshire. All four of us went this time, partly because we’d bought supporters’ packs for me and the girls, partly because there was the prospect of eating unhealthy food all day, and partly because it was going to involve walking around muddy woodlands in the dark. We did parkrun in the morning and then drove up pretty much straight afterwards, so we arrived late morning to lunchtime (ish), and after a few shenanigans trying to find the right place to park we ended up suitably parked up in a grassy field that was a short walk away from the hub of the action. In 2014 the organisers did an absolutely spectacular job to put on the event at all, after their original site cancelled on them a few weeks beforehand as a result of some bad press about potential damage that might get caused by loads of people tramping around in the darkness. Fair dos. I’ve been to such things before, and in Autumn and pathways can get trampled up into mush after a very short time. Such was the case at the previous years’ venue of Salcey Forest. The paths there degenerate into a mudbath from about the middle of September even without the added sport of a thousand hungry cachers racing around. So the new venue meant, of course, that they had to redesign their event village to suit a new location, and they also had to replan locations for every single cache. The unique selling point of the Halloween Hides events was always that the organisers put masses of effort into planning and then manufacturing a bunch of Halloween themed caches just for the event, which were then replaced at the same location by somewhat more regular cache boxes overnight after the event. Some of the caches were planned very much to suit a particular location, and of course they had to redo them all. They also had to rework some of their lab caches. All-in-all, they must have spent all hours reworking everything in that few weeks immediately before the event, and because of that it doesn’t surprise me that a couple of the crew got a bit burned out and didn’t want to contribute the following year. They must have been up all hours. So back to the actual caching day. The form is usually that they’d release one lot of ghoulishly daft caches for the daytime, and then release another set for the evening – the evening ones were all more fun if done in darkness. Because there are two lots of caches, you end up walking round the entire site twice. If you’d gone after the event and just done the “boring” cache boxes you’d have a lot less walking to do, however that’s not really the point. As I didn’t get chance to go to the 2013 event on the day I went back a couple of weeks later, and it took me 3 visits of a long half day each to do them. So we did all the daytime caches (around 50 in total including 10 lab caches) and then retired to the event village to let the girls have a bit of a rest. We grabbed some late lunch from a lard van and while the kids were relaxing I shot off into the woods to find a couple that we’d walked past on the first circuit. When darkness fell we were off like a rat up a drainpipe again with a further 15 caches to find in the darkness. They are quite easy on event day though, because you just walk to anywhere you can see torchlight. Wakerley Great Wood is definitely the spookiest of the three places I’d encountered for this event, because the wood itself is much less developed than Salcey Forest or Stanwick Lakes, with fewer wide pathways. In fact, it was quite a challenge following some of the pathways at all and I was really glad that I’d got the GPS loaded up in advance (from the “techie tent”) rather than having to try to load locations up manually. By the end of it all four of us were well past the point of having had enough. We were leaning over into the “too much” arena. By the time we got back to the car I think it was getting on 9pm and we had an hour drive to get home again. It was just as well it was the opening Saturday night of autumn half-term. Anyway, back at the car, we encountered what was likely to be a problem for some attendees. The presence of all those cars driving over the wet grassy field had turned it into a bit of a quagmire in places, and I could envisage that anyone who’d parked up in car with low ground clearance and/or two wheel drive was likely to have some fun getting out. We’d parked at the back of the field, which was also the top, and I’d sensibly parked with my nose pointing downhill, meaning we had a straight drive with no reversing to get out of out space. We’d also taken my car rather than Kas’s, which meant we had all the advantages of higher ground clearance and adaptive four-wheel drive. At a couple of points the car adapted itself by driving all four wheels. Some areas were distinctly boggy and slippery. I’m glad we got out when we did. The drive home down the A1 and around Bedford was uneventful, as such things should be. By the time we’d got home I’d missed much of Match of the Day, not that I was too bothered. On the following day I began to type up all the logs, and I downloaded the tracks off the GPS to see what distance we’d covered. I’d walked 24km. Because I shot out while the kids were rested up I’d maybe done 3km more than them, but nevertheless that means they’d walked the distance of a half marathon during the course of the day, over hilly, muddy and slippery footpaths. And the last third of it was in the dark too.